37. 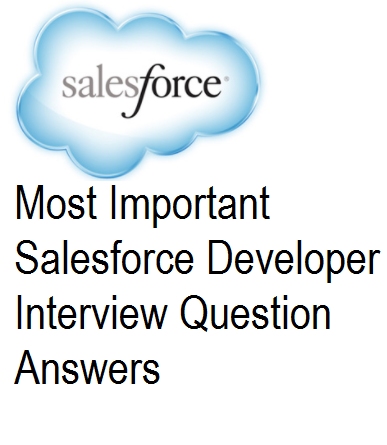 What are the various ways of deployment in salesforce? 38. What is an account team? Ans - Account team is group of users that work on a articular account. The users in a account team can be given access depending on the need. A account team appears as related list on account. 39. How to override a custom button on object with a visualforce page? Ans - Inorder to override a button with a visualforce page the page needs to use standard controller of that obejct. For example a account button can be overriden with visualforce page provided the page uses account standard controller. 40. What are various email templates types available in salesforce? 41. What is the difference between rendered and rerender in visualforce page? Ans - rendered can be used to hide or show a particular section of the page. It is mapped to a boolean variable that can set which shows or hides or executes that section or component. Rerender is used to refresh a section or component of the page. In Rerender the ids of the section need to be specified comma separated. 42. How can you expose a apex class as web service? and how to obtain a wsdl file for exposed class? A wsdl file for a apex class can be obtained by using the button generate wsdl on class.